Many people are applying for a specific job for which they are not suitable. The employer never contacts many candidates, and they never know about the failure of the job application. The rejection letter by most of the employer is written in a nonspecific way because most probably they fear the offense of the applicant. Most of the employers also write very precise and clear rejection letter because of not having enough time to respond some applications in details. Not writing an effective rejection letter puts a very negative impression on the mind of the employees. If you want the applicant to feel good about your organization, then try to write rejection letter in a completely professional way. 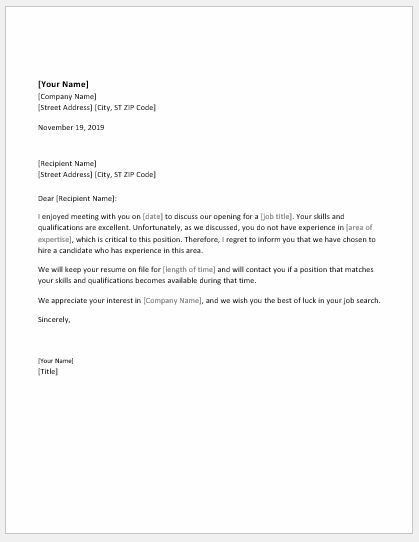 Writing the rejection letter effectively is important because you may be rejecting because of not having experience of working on that post but it is possible that the same employee is perfect for the other job post. Because of this, you may want the applicant to apply again. The candidates have a right to stay updated since he has invested a lot of time in submitting the application and attending the interview. It is equally beneficial for the recruiter because it enables the recruiter to save his time that may get wasted in responding the following up emails. If you are sure that the applicant who has applied is not suitable for the vacancy, then you should inform him immediately instead of waiting for the job post to be filled. The applicant should be given the rejection letter as soon as possible so that he can move on. The letter should be constructive, and it shouldn’t discourage the applicant. If you want the applicant to improve telling him some of his weak areas, you should start with some positive points and attributes that you have seen in the applicant during the interview. Following is given a sample template if you are running through the situation of rejecting some applicant due to lack of experience. DOWNLOAD, customize and send.